We love to watch the Oscars! A couple of years ago we thought it would be fun to create some party props for an Oscar viewing party. And ever since then, we’ve designed new printables for you every year. 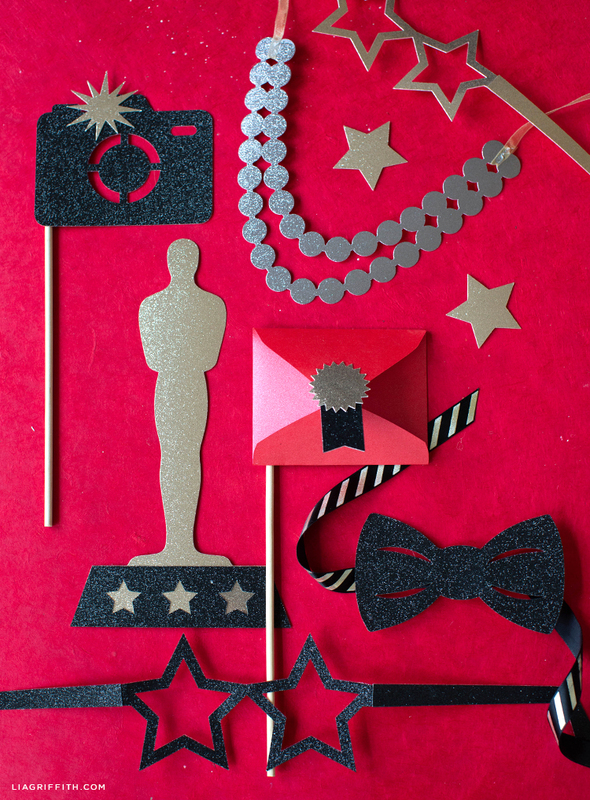 Today we’re sharing our Oscar party photo booth props along with the tools and materials we used to craft them. These Oscar party photo booth props are a simple way to liven up your viewing party and create a memorable night that everyone will remember. They also give you a fun excuse to dress up for Oscar night! And if you’re making some fancy cocktails, these star-studded stir ticks would be a great addition. All of these Oscary party photo booth props are simple enough to craft the night before. But you may want to send out your party invites soon! Once you’re done crafting all of your party props, don’t forget to print out your 2019 Oscar ballot. Love to host? We have party décor ideas for all types of events, get-togethers, and holidays. You can also follow us on Facebook, Pinterest, or Instagram for daily DIY project ideas. Or browse our YouTube channel for video tutorials on how to make paper flowers, home décor, and more. To download our DIY designs and templates, become a member. Questions? Feedback? Reach out to us in the comments below!